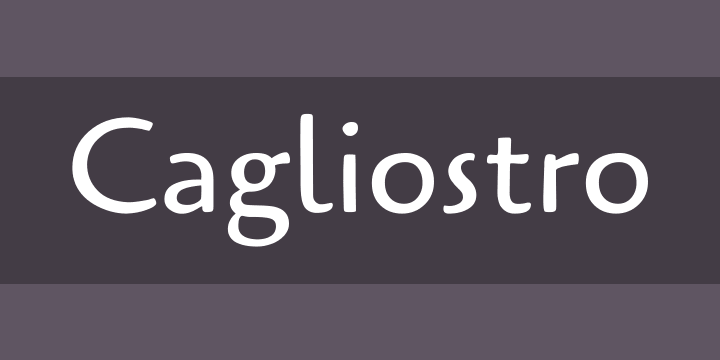 Copyright (c) 2011, Matthew Desmond (http://www.madtype.com | mattdesmond@gmail.com),with Reserved Font Name Cagliostro. Cagliostro was inspired by the early 20th Century lettering work of Ozwald Bruce Cooper. Care was taken to preserve the original hand-lettered feel of his work while updating the style for modern use. The x-height was increased from the original style and some of the more quirky aspects were toned back. The end result is a very handsome and unique sans that is very useful for titles and short blocks of text.